David Ervine: A tribute to when politicians were brave. I was 23 years old when David Ervine died. I didn’t know a great deal about politics but I knew that I liked him. I am not a loyalist. I’m not a Unionist, Nationalist or Republican. I am not a supporter of any one political party. I am more interested in how a politician can help Northern Ireland move on from our terrible past (and present). David Ervine was someone who stood against everything that I thought loyalism stood for. Anger, anti Sinn Fein, stuck in the past. He made me see that not all loyalists were violent and ignorant. He made me see that I was wrong. He stood out from the crowd in NI politics. He was likable and intelligent. The term visionary has never been more aptly applied to a politician in Northern Ireland now and in the past. I can’t help but wonder where we would be if he was still alive. Would the issues of flags and Loyalist identity been handled from a loyalist POV more calmly? Undoubtedly. Would the backward and unhelpful voices of loyalists like Jamie Bryson be so readily listened to? I don’t think they would. 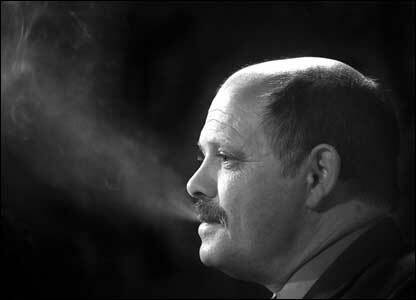 What made David Ervine special was his ability to see past the status quo. To stand against others in his tradition and realize that there was another way. That hatred was a dead end to peace. That we shouldn’t judge a book by it’s cover or by which street you grew up on. He was not perfect. He was a UVF soldier. But that did not define him. What defined him was his love for NI and his steadfast belief that Loyalists and Republicans could work together. Today when Peter Robinson the First Minister sits by Martin McGuinness you get the feeling it is begrundingly. When David Ervine did it you felt that it was because he genuinely liked the guy. His bravery is something that we all can learn from. When we come face to face with the chance to change how we think or how we do things there will always be resistance. The status quo is a powerful thing because we don’t know much else and the unknown raises a load of questions we can’t always see the answers to right away. Easier to remain in our hatred for the unknown than to embrace the idea that there might be a better way. Easier to continue to think and work in a way that is leading nowhere than admit that maybe we have failed. But failure is the only way we learn and grow. The failure to see that blaming others for the past and present does not work. David Ervine realized that violence was not working. He realized that the approach he used had failed. His strength was that he wasn’t arrogant enough to stubbornly stick to the same path. His strength was knowing that admitting that, did not make him or loyalism weak. Which meant he was brave and helped Northern Ireland move forward. A bravery that has been mostly inconspicuous in Northern Ireland politics ever since.